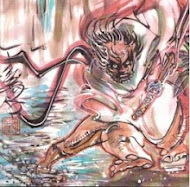 Cover Image: Again, the cover image is a more detailed close-up of one of the first panels within this particular issue. In this case, the cover is a close-up of panel 2 on page 1. 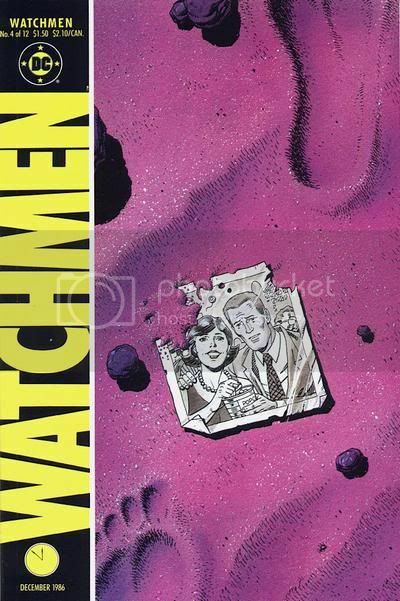 Panel 1: The photograph in Dr. Manhattan’s hand – the photograph seen on the cover – is of him (as Jon Osterman, before the accident that changed him into this godlike being) and Janey Slater, his former lover and the woman that exposed him in the Nova Express interview from the previous chapter. The manner in which Dr. Manhattan views the photograph – “It is the photograph of a man and a woman” – again shows how far removed from humanity he has become. Panel 2: This panel, with its caption stating what will happen, is the first time we as readers experience the manner in which Dr. Manhattan views and experiences time. He is seeing the picture in the sand twelve seconds into his future, but he – along with us, the audience – is also experiencing it in the present. All things occur in the present for Dr. Manhattan. This all-encompassing experience of time – having the past, present, and future all happen at the same time – is how we, the audience, will experience this story over the next 27 pages. Panel 8: “I am going to look at the stars.” The stars are a metaphor for the photograph he just dropped in the red sand. For us, and for Dr. Manhattan, the fact that it takes so long for light to travel across the galaxy means, in essence, we are only looking at “photographs” of stars. We are seeing a snapshot from some distant past, showing us how the stars looked millions of years ago. But, we are unable to visualize them in their present state, even if they are still burning today. The photograph in the sand represents the same thing. A snapshot – formed by the reflection of light upon film – of a moment in time, a moment in the past, that will show only what was and not what is. Panel 9: That previous insight is stated concretely here.